View manager status: Shows status of all the managers. 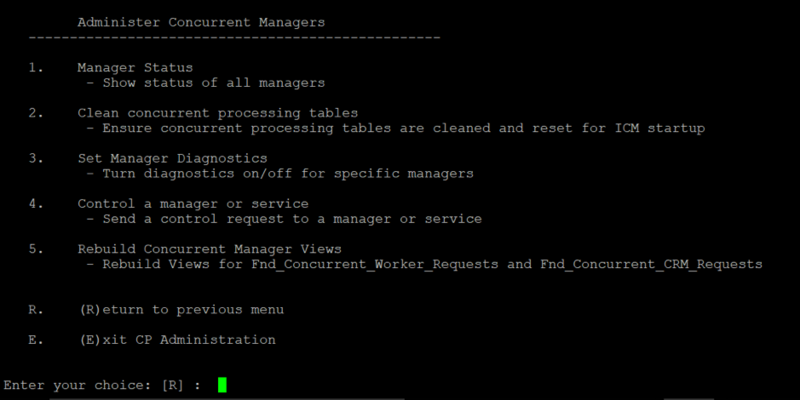 You can view all running concurrent manager (CM) statuses (with or without process IDs). The same status information is shown in the Administer Concurrent Managers form and on the Oracle Access Manager (OAM) Concurrent Managers page. Clean concurrent processing tables: Helps clear concurrent processing (CP) tables and ensures CP tables are cleaned and reset for Internal Concurrent Manager (ICM) startup. Set manager diagnostics: Sets CM diagnostics and lets you turn diagnostics on and off for specific managers. Control a manager or service: Sends a control request to a manager or service and starts, stops, or verifies an individual CM. Rebuild concurrent manager views: Rebuilds the CM views for Fnd_Concurrent_Worker_Requests and Fnd_Concurrent_CRM_Requests. Analyze concurrent requests: Analyzes concurrent requests and prints out the details. This task was added in Oracle EBS 12.2.x. Move request files: Changes the request log and output file locations. This task was added in Oracle EBS 12.2.x. Note: Screenshots are taken from Oracle EBS version 12.1.3. Choose the tasks to perform. When you're finished, press R to return to the previous menu. To activate the CPADMIN utility in EBS, apply the Concurrent Processing RUP2 Patchset 22549247, which is RUP3 for Concurrent Processing Release 12.1.3. This patch consolidates Concurrent Processing RUP2 (19287293) along with all fixes released after RUP2. Note: Before you apply patch 22549247, ensure that you have applied patches 17884289 and 8919491. For Oracle EBS 12.2.x, this feature is already enabled. CPADMIN is an interesting tool that consolidates different CP management functions into a single menu-based tool. It is simple to use, and you can run it in PuTTY® to monitor the CM status and start or stop the manager from the backend. You don’t need to open an application URL to monitor a CM or to start or stop the manager. With this tool, you can execute multiple tasks with a single command. CPADMIN replaces cmclean.sql, so use CPADMIN to perform that function. You can do multiple CP-related tasks from the backend, which you previously could not perform.